By Natalie Prinz, ISATEC student at the University of Bremen and the ZMT. A 18km2 small near-atoll named Aitutaki was “home” from October 2016 till March 2017, one of 15 islands of the self-governing island country, the Cook Islands. The island is known for its 50km2 large, very shallow (deepest point of about 10m), triangular lagoon which is enclosed by a barrier reef. 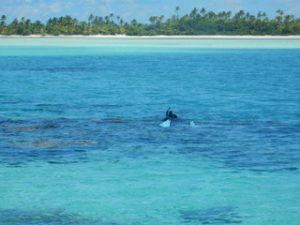 As the flagship lagoon, Aitutaki is very important to the Cook Islands’ tourism industry and visitors from many countries take the journey to see the beauty of Aitutaki’s marine life. Fish feeding is a world-wide popular technique to attract wildlife and provide a close-up experience for snorkelers. Similarly, Aitutaki tour operators use a range of supplementary food to concentrate smaller and bigger reef fish close to the boat. 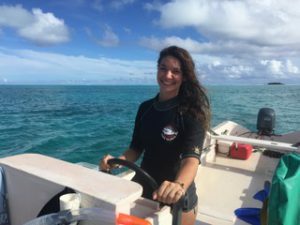 As part of the REPICORE project, the primary purpose of the fieldwork for my Master thesis was to collect data in the lagoon to estimate in how far fish feeding will affect the naturally occurring fish community around a coral assemblage. Secondly, I would like to see whether additional feeding affects the natural feeding behaviour of the fish. It will also be of interest if their behaviour is influenced by the presence of snorkelers and whether there will be differences in areas where the fish are used to people in the water versus where feeding is not daily activity. Beyond all scientific endeavours it was an absolute pleasure to be able to ‘dive into’ the island life and learn the Cook Island way of living. Coconuts, flowers, pareo’s (island sarong) and a little scooter is all you need to make every hot day pass pleasantly. I learned a lot from the people and it was great to see that many initiatives are on the way to make the island more suitable for sustainable living. Through the Ministry of Marine Resources, Pacific Island Conservation Initiative and also with the help of Cook Island Tourism and the Aitutaki Conservation Trust it was possible to develop and implement the fieldwork day by day. A socioecological aspect of the perception of fish feeding by locals, residents and visitors will add to our understanding if feeding fish is an important tourist attraction or rather a superfluous activity that won’t be missed within the beauty of the lagoon.